William Turner RA (baptized 14 May 1775 – 19 December 1851) was a British Romantic landscape painter, water-colourist, and printmaker. Turner was considered a controversial figure in his day, but is now regarded as the artist who elevated landscape painting to an eminence rivalling history painting. .. [I] reprobate the mechanically systematic approach of drawing.. ..so generally diffused. I think it can produce nothing but manner and sameness. Hawkey - Hawkey [Mr. Fawkes of Farnley Hall, North Yorkshire, close friend of Turner] - come here - come here! Look at this thunderstorm! Isn't it grand? - Isn't it wonderful? - Isn't it sublime?. .There, Hawkey; in two years you will see this again, and call it 'Hannibal Crossing the Alps'. In our variable climate where [all] the seasons are recognizable in one day, where all the vapoury turbulence involves the face of things, where nature seems to sport in all: her dignity and dispensing incidents for the artist’s study.. ..how happily is the landscape painter situated, how roused by every change in nature in every moment, that allows no languor even in her effects which she places before him, and demands most peremptorily every moment his admiration and investigation, to store his mind with every change of time and place. Dear Jones, - Two months nearly in getting to this Terra Pictura, and at work; but the length of time is my own fault. [because] I must see the South of France, which almost knocked me up, the heat was so intense, particularly at Nismes and Avignon; and until I got a plunge into the sea at Marseilles, I felt so weak that nothing but the change of scene kept me onwards to my distant point. Genoa, and all the sea-coast from Nice to Spezzia, is remarkably rugged and fine; so is Massa.. .Hope that you have been better than usual, and that the pictures go on well. My dear Chantrey, - I intended long before this (but you will say, Fudge) to have written: but even now very little information have I to give you in matters of Art, for I have confined myself to the painting department at Corso; and having finished one, am about the second, and getting on with Lord E.'s, which I began the very first touch at Rome; but as the folk here talked that I would show them not, I finished a small three feet four [painting] to stop their gabbling..
Dear Jones.. [I] give you some account of.. ..the last sad ceremonies paid yesterday to departed talent gone to that bourne from whence no traveller returns. Alas, only two short months Sir Thomas followed the coffin of Dawe to the same place. We then were his pall-bearers. Who will do the like for me, or when, God only knows how soon; my poor father's death [Sept. 1829] proved a heavy blow upon me, and has been followed by others of the same dark kind. Chantrey [good friend of Turner] is as gay and as good as ever, ready to serve: he requests, for my benefit, that you bottle up all the yellows which may be found straying out of the right way; but what you may have told him about the old masters which you did not tell me, I can't tell, but we expected to hear a great deal from each other, but the stormy brush of Tintoretto was only to make the 'Notte' more visible. Painting can never show her nose in company with architecture without being snubbed. He John Ruskin knows a great deal more about my pictures than I do; he puts things into my head, and points out meanings in them that I never intended. If I could find anything blacker than black, I'd use it. Dear Sir, - I have truly, I must say, written three times, and now hesitate; for did I know your son's works, or, as you say, his gifted merits yet even then I would rather advise you to think well, and not be carried away by the admiration which any friendly hopes (which ardent friends to early talent) may assume: they know not the difficulties or the necessities of the culture of the Fine Arts generally speaking. In regard to yourself, it is you alone can judge how far you are inclined to support him during perhaps a long period of expense; and particularly if you look towards tuition, the more so; for it cannot insure success (however much it may facilitate practice), and therefore it behooves you to weigh well the means in your power before you embark in a profession which requires more care, assiduity, and perseverance than any person can guarantee. No, Mr. Williams, certainly not; if Mr. Drake [a solicitor of the English Railway Company] has purchased a 'Turner', he ought to know it is a Turner; I was once silly enough to look at a picture that I was told had been painted by me, and I found myself soon after stuck up in a witness-box, giving evidence about it; I then said I'll never be so silly again. Dear Hawkesworth, Mother Goose came to a rehearsal before Christmas day, having arrived on Saturday for the knife.. .Many thanks for the brace of pheasants and hares—by the same train—indeed, I think it fortunate, for with all the strife and strike of pokers and stokers for the railroads - their commons every day growing worse - in shareholders and directors squabbling about the winding up the last Bill, to come to some end for those lines known or supposed to be in difficulty.. .I am sorry to say my health is much on the wain. I cannot bear the same fatigue, or have the same bearing against it, I formerly had - but time and tide stop not - but I must stop writing for today.. It is necessary to mark the greater from the lesser truth: namely the larger and more liberal idea of nature from the comparatively narrow and confined; namely that which addresses itself to the imagination from that which is solely addressed to the eye. My business is to paint what I see, not what I know is there. Then you will do away with the only social meetings [at the Art Academy in London ] we have, the only occasion on which we all come together in an easy, unrestrained manner. When we have no varnishing days, we shall not know one another. I never in my whole life could make a drawing like that; I would at any time have given one of my little fingers to have made such a one [one of Girtin's yellow drawings]. [Turner has] no systematic process for making Drawings – He avoids any particular mode that He may not fall into manner. By washing and occasionally rubbing out, he at last expresses in some degree the idea in his mind. 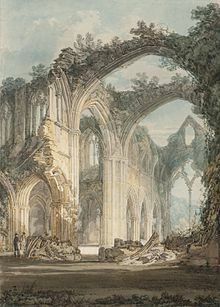 Highly to the credit of this artist [Turner], he is indebted principally to his own exertions for the abilities which he possesses as a painter, and for the respectable situation he holds in society. He may be considered a striking instance of how much may be gained by industry (if accompanied by temperance), even without the assistance of a master. The way he acquired his professional powers was by borrowing, where he could, a drawing or picture to copy from, or by making a sketch of any one in the Exhibition early in the morning, and finishing it at home. By such practices, and by a patient perseverance, he has overcome all the difficulties of the art; so that the fine taste and colour which his drawings possess are scarcely to be found in any other, and are accompanied with a broad, firm chiaroscuro and a light and elegant touch. 'One stormy day at Farnley, Turner called to me loudly from the doorway: 'Hawkey - Hawkey! [his friend Mr. Fawkes, of Farnley Hall ] - come here - come here! Look at this thunderstorm! Isn't it grand? - Isn't it wonderful? - Isn't it sublime?' All this time he was making notes of its form and colour on the back of a letter. I proposed some better drawing-block, but he said it did very well. He was absorbed - he was entranced. There was a storm rolling and sweeping and shafting out its lightning over the Yorkshire hills. Presently the storm passed, and he finished. 'There', said he, 'Hawkey; in two years you will see this again, and call it 'Hannibal Crossing the Alps'. It [the painting Snow Storm: Hannibal and his Army Crossing the Alps ] is so ambiguous as to be scarcely intelligible in some parts (and those the principal), yet as a whole, it is novel and affecting. ..he [Turner] sat at the table [in Farnley ], tearing up the sea with his eagle-claw of a thumb-nail, and working like a madman; yet the detail is full and delicate, betraying no sign of hurry. Turner - never sketched much in oil [like a. o. Constable did]; he always got the colour too brown [if he did]..
His glance commanded in an instant all that was novel in [a] scenery, and a few outlines on paper recorded it unintelligibly to others. He placed these pictorial memoranda upon mill-board, not larger than a sheet of letter-paper, quite a confused mass. How he worked out the details from such sketches seemed to me wonderful. His views around Plymouth, in the engravings from his pictures, were marvelously varied in effect, as well as faithful representations. His first sketches showed little of the after-picture to the unpracticed eye; perhaps he bore much away in memory, and these were only a kind of shorthand, which he deciphered in his studio. We once ran along the coast to Borough, or Bur Island, in Bibury Bay. . ..The sea was boisterous, the morning unpropitious. Our boat was Dutch built, with outriggers and un-decked.. ..when running out from the land the sea rose higher, until off Stokes Point it became stormy. We mounted the ridges bravely. The sea in that part of the Channel rolls in grand furrows from the Atlantic.. ..All this time Turner was silent, watching the tumultuous scene.. .. The little island [Bur Island], and the solitary hut it held, the bay in the bight of which it lay, and the dark long Bolt head to seaward, against the rocky shore of which the waves broke with fury, made the artist become absorbed in contemplation, not uttering a syllable.. ..While [later] the shell-fish were preparing, Turner, with a pencil, clambered nearly to the summit of the island, and seemed writing rather than drawing. How he succeeded, owing to the violence of the wind, I do not know. He probably observed something in the sea aspect which he had not before noted. 'The woods are fine, and the views of some of the headlands round which the river winds are of exquisite beauty. In one place he was much struck, took a sketch, and when it was done said, 'We shall see nothing finer than this if we stay till Sunday; because we can't'. It was the last visit he paid to the scenery of the Tamar before he quitted the West. It was to the honour of several of the inhabitants of Plymouth that boats, horses, and tables were ready for his use during the time he remained. Everybody felt that in paying him attention they were honouring a most extraordinary genius.. I remember one evening on the Tamar [river in South-west England]; the sun had set, and the shadows become very deep. Demaria, looking at a seventy-four [ship] lying under Saltash in Cornwall, said, 'You were right, Mr. Turner; the ports cannot be seen. The ship is one dark mass'. 'I told you so', said Turner: 'now you see it all is one mass of shade'. 'Yes, I see that is the truth, and yet the ports are there'. [Turner:] 'We can take only what we see, no matter what is there. There are people in the ship: we don't see them through the planks'. 'True', replied Demaria. There had been a discussion on the subject before between the two professional men, in which Turner had rightly observed that after sunset, under the hills, the port-holes were undiscernible. We now had ocular proof of it. Turner was struck with admiration at the bridge above the Wear, [near Endsleigh Cottage which he declared altogether Italian.. .. Before six in the [next] morning he rose, and went down towards the bridge. The air was balmy; the strong light between the hills, the dark umbrage, and the flashing water presented a beautiful early scene. Turner sketched the bridge, but appeared, from changing his position several times, as if he had tried more than one sketch, or could not please himself as to the best point. I saw that bridge and part of the scene afterwards in a painting in his gallery. He had made several additions to the scenery near the bridge from his own imagination. The picture was poetical; and, if I remember rightly, he had introduced into it some of the fictitious characters of the heathen mythology; he had bathed it in the gorgeous glories of the southern sun, clothed it in barbaric pearl and gold..
We were sailing together in a boat on the St. Germains river, near Ince Castle.. ..Turner, Collier, and myself were the only persons present, except the boatmen. I was remarking what a number of artists the West of England had produced, particularly Devon and Cornwall. I enumerated all I could remember from Reynolds to Prout. When I had done, Turner said, 'You may add me to the list; I am a Devonshire man'. I demanded from what part of the county, and he replied, 'Barnstaple'. I have many times since repeated the incident to others, who would insist that the artist was a Londoner [officially born in [[w:Maiden Lane, Covent Garden|Maiden Lane, in London]. Turner visited Plymouth (my native town) while I was staying there in the summer of 1813, or perhaps 1814 (1812 ? ), painting portraits. As he wished to see the scenery of the river Tamar - [river in South-west England], I accompanied him, together with Mr. Ambrose Johns from Plymouth.. ..to a cottage near Calstock, the residence of my aunt, Miss Pearce, where we all stayed for a few days. From that point as a centre Turner made various excursions, and the result of one of his rambles was a sketch of the scene which afterwards grew into the celebrated picture of the painting 'Crossing the Brook'. The bridge in that picture is Calstock Bridge; some mining works are indicated in the middle distance. The extreme distance extends to the mouth of the Tamar, the harbour of Hamoaze, the hills of Mount Edgcumbe, and those on the opposite side of Plymouth Sound. The whole scene is extremely faithful. The large early [watercolor]-drawings of Turner were sponged without friction, or were finished piece by piece on white paper; as he advanced he laid the chief masses first in broad tints, never effacing anything, but working the details over these broad tints. While still wet, he brought out the soft lights with the point of a brush, the brighter ones with the end of a stick; often, too, driving the wet colour in a darker line to the edge of the light, in order to represent the outlines of hills. His touches were all clear, firm, unalterable, one over the other: friction he used only now and then, to represent the grit of stone or the fretted pile of moss; the finer lights he often left from the first, even the minutest light, working round and up to them, not taking them out as weaker men would have done. I was curious in observing what he made of the objects he selected for his sketches, and was frequently surprised to find what a forcible idea he conveyed of a place with scarcely a single correct detail. His exaggerations, when it suited his purpose to exaggerate, were wonderful - lifting up, for instance, by two or three stories, the steeple or rather stunted cone of a village church - and when I returned to London, I never failed to roast him on this habit. He took my remarks in good part, sometimes indeed in great glee, never attempting to defend himself otherwise than by rolling back the war into the enemy's camp..
Turner was always, from his youth, fond of stones.. .But that gorge [which Turner passed during his trip in the diligence - South-Switzerland, North of Milan].. ..delighted him exceedingly.. ..[and] was still not well out of his head when the diligence stopped at the bottom of the hill, just at that turn of the road on the right of the bridge, which favourable opportunity Turner seized to make what he called a 'memorandum' of the place, composed of a few pencil scratches on a bit of thin paper, that would roll up with others of the sort and go into his pocket afterwards. These pencil scratches he put a few blots of colour upon (I suppose at Bellinzona the same evening, certainly not upon the spot), and showed me this blotted sketch when he came home [England]. I [Ruskin] asked him to make me a drawing of it, which he did.. .The trees Turner cuts away, and gives the rock a height of about a thousand feet, so as to imply more power and danger in the avalanche coining down the couloir. Next, he raises, in a still greater degree, all the mountains beyond, putting three or four ranges instead of one, but uniting them into a single mossy bank at their base..
wherever he [Turner] could get a few minutes, he had his little sketch book out, many being remarkable, but he seemed to tire at last and got careless.. .I don't remember colouring coming out till we got into Switzerland. [When it did, Turner used a sponge to create 'misty and aerial effects']. Mr. Turner only displayed in the closest intimacy the shrewdness of his observation and the playfulness of his wit. Everywhere he kept back much of what was in him, and while the keenest intelligence, mingled with a strong tinge of satire, animated his brisk countenance, it seemed to amuse him to be but half understood. His nearest social ties were those formed in the Royal Academy, of which he was by far the oldest member, and to whose interest he was most warmly attached. The zealous care with which Turner endeavoured to do his duty, is proved by a large existing series of drawings, exquisitely tinted, and often completely coloured, all by his own hand, of the most difficult perspective subjects—illustrating not only directions of line, but effects of light - with a care and completion which would put the work of any ordinary teacher to utter shame. In teaching generally — he would neither waste time nor spare it - he would look over a student's drawing at the Academy, point to a defective part, make a scratch on the paper at the side, say nothing. If the student saw what was wanted, and did it, Turner was delighted; but if the student could not follow. Turner left him. 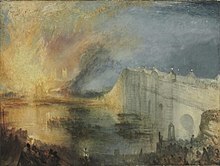 Turner's late peculiarities in painting arose from the neglect of his earlier works by the public; if he had been encouraged at the time he painted the 'Carthage', the 'Tenth Plague' and the 'Garden of the Hesperides' he would not have become eccentric in his art; his preference for the style of picture last named is proved by his leaving the pictures of the 'Rise of Carthage' and the 'Dutch Coast' to the National Gallery, on the condition of their being hung between the 'Seaport' and the 'Mill' by Claude Lorraine [strongly admired by Turner]. His latter style, though possibly extravagant, was only an excess in representing the developments of nature; he exaggerated all he saw, but the foundation was truth; the vivid and warm colouring of nature he painted with the deepest reds and yellows, the greys he attempted to imitate with blues of too strong a tint, yet the whole was true in principle, in general and particular. During twenty-five years, he [Turner] indulged the pleasing hope that he should leave a testimony of his good will and compassion for unfortunate artists. To his intimate friends he constantly talked of the best mode of leaving property for the use of the unsuccessful; he wished his survivors to employ his property in building houses for the above-named purpose; he did not like to call them almshouses, but had selected the denomination of 'Turner's Gift'. On one occasion [1840's] I had the audacity to ask him [Turner] if he painted his clouds from nature.. .The words had hardly passed my lips when I saw my gaucherie. I was afraid I had roused a thunderstorm; however, my lucky star predominated.. ..after having eyed me for a few moments with a slight frown, he growled out 'How would you have me paint them?' Then seizing upon his fishing-rod, and turning upon his heel, he marched indignantly out of the house to the water's-edge. Quotes about Turner, by Rev. Henry Scott Trimmer, 1850's; as cited in The Life of J. M. W. Turner R.A. , George Walter Thornbury - A new Edition, Revised; London Chatto & Windus, 1897, p. 116-139 + 254. At the beginning of the century Turner had a place at Hammersmith Mall [West-London, from c. 1802], The garden, which ran down to the river, terminated in a summer-house; and here, out in the open air, were painted some of his best pictures. It was here that my father [James Trimmer], who then resided at Kew, became first acquainted with him; and expressing his surprise that Turner could paint under such circumstances, he [Turner] remarked that lights and room were absurdities, and that a picture could be painted anywhere. The old man [Turner's father] latterly was his son's willing slave, and had to strain his pictures, and varnish them when finished; which made Turner say that his father began and finished his pictures for him. But I doubt if he varnished many pictures; few of them, I believe, were varnished at all; still he was of great assistance to his son, and I think it was Mr. Turner the engraver who told me that, once making bold to enter Turner's studio, he found the old man on his knees colouring a canvas, when Turner made his appearance, and good-humouredly trundled out the visitor [Turner, the engraver], telling him he was on forbidden ground. Turner was much attached to his father, and at his death stayed with us a few days at Heston for change of scene. He was fearfully out of spirits, and felt his loss, he said, like that of an only child.. .Turner never appeared the same man after his father's death [in 1829]; his family was broken up..
About this time [c. 1812] Turner removed to Twickenham, where he purchased Sandycomb Lodge, near Richmond Bridge [London]. It was an unpretending little place, and the rooms were small. There were several models of ships in glass cases, to which Turner had painted a sea and background. They much resembled the large vessels in his sea pieces. Richmond scenery greatly influenced his style. The Scotch firs (or stone-pine) around are in most of his large classical subjects, and Richmond landscape is decidedly the basis of 'The Rise of Carthage'. Here he had a long strip of land, planted by him so thickly with willows that his father, who delighted in the garden, complained that it was a mere osier-bed. Turner used to refresh his eye with the run of the boughs from his sitting-room window. He had a boat at Richmond.. ..I have seen him start on his sketching expeditions. From his boat he painted on a large canvas direct from Nature. Till you have seen these sketches, you know nothing of Turner's powers. There are about two score of these large subjects, rolled up, and now national property. In my judgment these are among his very finest productions: no retouching, everything firmly in its place.. ..Turner's mind was so comprehensive that he could not carry out the detail, though he was far from despising it; and I was told by [Henry] Howard he would spend hours sketching a stone. There is a red sunset (simply the sky) among the rolls; the finest sky, to my mind, ever put on canvas. Besides his boat, he had a gig and an old horse; an old crop-eared bay horse, or rather a cross between a horse and a pony. In this gig he used to drive out sketching, and take my father [James Trimmer] and myself with him. His sketching apparatus was under the seat. I remember once going on an expedition of this kind to Staines, and thence to Runnymede, where he made some sketches. From there he painted a picture which strongly resembles the place to this day. We went, I remember, at a very steady pace, for Turner painted much faster than he drove. He said, 'if when out sketching you felt at a loss, you had only to turn round or walk a few paces farther, and you had what you wanted before you.' He has immortalized his old crop-ear in his [painting] 'Frosty Morning'. Henry Howard, R.A., was an early friend of my father's; and he and Turner have stayed with us at Heston. I remember, when I was about five years old, going to Penn, in Buckinghamshire, with Howard, Turner, and my father [c. 1812]; all of them in search of the picturesque. We went in a post-chaise, and, when tired, my father carried me pick-a-back. We came to a halt in a grove or copse where luxuriated wild flowers in profusion. It was a charming day; and, though so many 'years bygone' I can see now vividly before me my father and Howard, both standing legs a-straddle, and Turner at a little distance in a ditch, all hard at work at the easthetical. After a while Turner emerged from his retreat with a capital water-colour, with which Howard and my father were in raptures. He said he got into the ditch to avoid the sun, but Howard whispered my father that it was to avoid showing his modus operandi. I have heard this from my father subsequently..
Howard.. ..often got into warm professional disputes with him [Turner]. But Turner was mostly in the right. They once, I remember, had a very hot dispute, and for the time being lost temper. Howard maintained they should paint for the public; Turner, that public opinion was not worth a rush, and that one should paint only for judges.. ..The vulgar, on the whole, would understand form better than colour, and low subjects better than cultivated ones; so that Turner argued wisely, with reference to himself, in painting for the cultivated few. Turner was very communicative to my father [in instruction], and would point out to him any defect in sketching. I think he fairly instructed my father in painting in his own method; which was to lay the dead colours as nearly as possible in the forms you wished, leaving as little as possible for finishing, using as a vehicle nothing but linseed oil, diluted as required in spirits of turpentine. I have heard him speak most enthusiastically in praise of Gainsborough's execution and Wilson's tone, and he plainly thought himself their inferior. My father had some admirable oil sketches of Gainsborough; and these Turner one evening examined by candle-light so closely that the next morning he complained of having hurt his eyes. Turner and Thomson of Duddingston, whom he met at Edinburgh, belonged to the same set of artists and painters, and used to go out sketching and painting together. At the meetings of the clique Turner would constantly battle with them upon the subject of light, trying to gain from Brewster and other 'savans' information thereon; and it is supposed that the discussions contributed to form a theory which enabled him to create the varied effects he has displayed in his works. To such a height, indeed, did he carry the verbal contests that the subject, it is said, finally was prohibited; and he then became more earnest to discover what combination of colour would produce light. Many years ago, when he was making sketches for the 'Provincial Antiquities' [Scottish!] in the company of Cadell, the Edinburgh bookseller, as they passed Norham, Turner took off his hat and made a low bow to the ruins. Observing this strange act of homage, Cadell exclaimed, 'What the Devil are you about now?' 'Oh,' was Turner's reply, 'I made a drawing or painting of Norham several years since.. ..and from that day to this I have had as much to do as my hands could execute. ..Turner did not believe that colour was reducible to system; and Gainsborough, when painting his 'Blue Boy' seems to have been of the same opinion. I knew him, when a boy, and have often paid him a guinea for putting backgrounds to my architectural drawings, calling upon him for this purpose at his father's shop in Maiden Lane, Covent Garden. He never would suffer me to see him draw, but concealed, as I understood, all that he did in his bedroom. After plunging them into water, he [Turner] dropped the colours onto the paper while it was wet, making marblings and gradations throughout.. .His completing process was marvellously rapid, for he indicated his masses and incidents, took out half-lights, scraped out high-lights and dragged, hatched and stippled until the design was finished. This swiftness, grounded in the scale practice in early life, enabled Turner to preserve the purity and luminosity of his work, and to paint at a prodigiously rapid rate. Turner was much more interested in the interplay between the atmosphere and sunlight and how he could use this to heighten the effects of his landscapes and seascapes. John Constable rarely painted the atmosphere at all but concentrated on the clouds and the sky. The visibility in Constable's landscapes is nearly always very good, such that the horizon can be clearly seen; he rarely painted mist or fog. Turner on the other hand delighted in mist and fog which often blot out the horizon and sky in his paintings.